Nikola Tesla — World opinion does not affect him. All that was long ago and Tesla has lingered on into a twilight of semi-obscurity. His hotel room is now his only laboratory, his brain his only tool. When callers importune him he takes a bath or goes to bed. When he talks about his work his deep-set blue eyes burn with an icy fire. He walks prodigious distances through the city streets. His most valued friends are the New York Public Library’s somnolent pigeons. A life-long bachelor, Dr. Tesla is tall, spare, erect, parchment-skinned, beak-nosed. The mustache he once wore is gone. Even at the peak of his renown he had great visions. In 1900 he was ready to cure tuberculosis with oscillating electricity. In 1909 he promised motors capable of driving ocean liners at 50 knots. In 1911 it was storm-proof dirigibles without propellers. In the last decade his annual utterances have been mostly rehashes of previous interviews, with something new every three or four years. 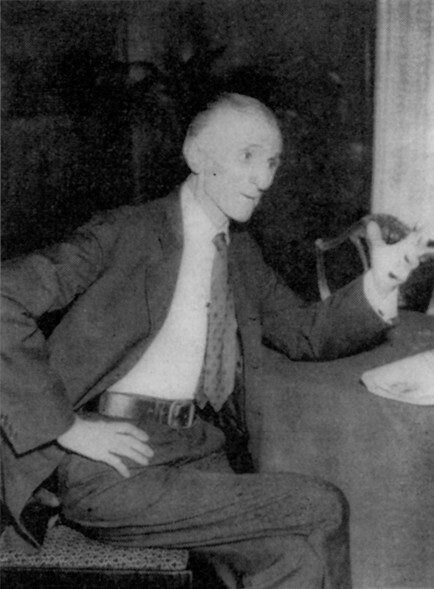 In 1924 he was planning to transmit power by radio. In 1927 he was scheming to harness sea power. In 1931 he would make all fuels superfluous by tapping cosmic energy. Last week Dr. Tesla announced a combination of four inventions which would make war unthinkable. Nucleus of the idea is a death ray — a concentrated beam of sub-microscopic particles flying at velocities approaching that of light. The beam, according to Tesla, would drop an army in its tracks, bring down squadrons of airplanes 250 miles away. Inventor Tesla would discharge the ray by means of: 1) a device to nullify the impeding effect of the atmosphere on the particles; 2) a method for setting up a high potential; 3) a process for amplifying that potential to 50,000,000 volts; 4) creation of “a tremendous electrical repelling force.” Two of these are complete in Dr. Tesla’s mind. The other two await minor details. Dr. Tesla pointed out that the weapon is purely one of defense, since his beam must be generated in great immovable power plants. With generators set up on all the world’s national boundaries, no country would ever again be able to attack another. Further details, said Dr. Tesla, would be unfolded before the Geneva Disarmament Conference. The death ray, always exciting to laymen, is an old familiar to scientists. After the interplanetary “space ship,” it is probably the most popular gadget in pseudoscientific fiction. Even in Herbert George Wells’s shrewdly written War of the Worlds (1898), the first act of arriving Martians is to spray spectators with a death beam. In real life death rays have been announced time & again, but never convincingly demonstrated. When one Harry Grinnell-Matthews loudly announced a death ray some years ago in England, Physicist Robert Williams Wood of Johns Hopkins said he would stand 65 ft. from the apparatus and invite Mr. Grinnell-Matthews to turn on his radiations full blast. Last month in Omaha the Inventors’ Congress was informed by its President Albert G. Burns that he had witnessed a death ray demonstration staged by a Clevelander named Antonio Longoria. Rabbits, dogs and cats, said President Burns, were killed instantly, their blood turned to water. But Inventor Longoria said he would withhold his secret until invasion threatened the U. S.